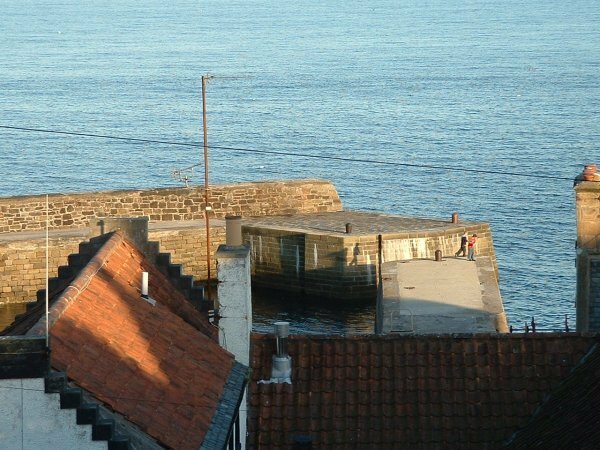 The simplest way to get to Cellardyke Harbour is to follow the instructions for Cellardyke Harbour Rocks mark,but carry on further along the road that you are on until the harbour appears to your right,about 300 yards past the car park described. Alternatively carry on the main coast road through Anstruther towards Crail,and just as you leave Anstruther/Cellardyke,you will pass a health centre to your right,followed by a new housing scheme.Just after the new houses,there is a turnoff to your right signposted Windmill Road.Take this road and follow it down and you'll see the harbour at the bottom. 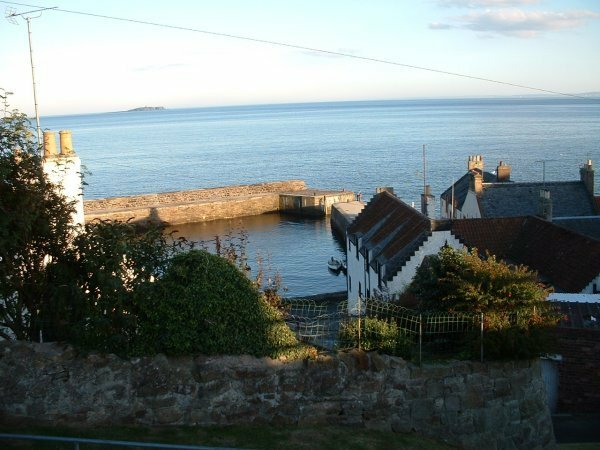 This harbour is quite small and does not stick out very far into the sea at all but is a very productive mark.In the distance here you can see the May Island.You have the choice to cast towards it,or cast towards Anstruther Harbour which you'll see when you are on the pier.Either direction is good,but from day to day,it varies which is best.So if you're doing one and not catching,switch to the other. This pier has a good record of fish,mainly red cod and wrasse,and I have seen a 14lb'er being caught here myself.It is very good in winter as well as summer,and as you'll see from the photo,the pier wall affords a shelter in an easterly wind. Like everywhere else in Cellardyke though,the ground is very unforgiving and a swell on the sea can drive you nuts snagging up every cast.My personal preference here is a quiet early summer evening,but that's probably as much to do with my comfort as anything else.It is a relatively safe winter mark,and not being too far away from the shore it catches some of the street lighting. Summing up I'd say you'll catch lots of fish,but lose lots of tackle,but isn't that always the way.